When you have found a place of solitude to be alone with God, it is best that you have some idea what you will do—the activities that will make up your quiet time. Here are five suggestions. 1. Meditate and pray over the scriptures. This I believe should be the very first and the main activity in solitude. Without this step of opening our Bible and digging out the truths God wants us to know, our time in solitude would be misdirected and highly unproductive. As we open our Bible, let us be mindful of the whole reason why we should desire solitude with God and why we are beginning the time by studying the Word. It is not so much just to gain knowledge or for any personal gain or experience; rather, the time of study and prayer, and our whole time of solitude, must be for His will and pleasure, and a time to conform our will to His will, so that in the end we will be found as having pleased Him. 2. Pray over the most urgent things that God has put on your heart. After you have dug into the Word and prayed over it, God may begin to speak to you about things that He wants you to do, or about some person, or a family, or a group of people that have a particular need. Don’t put that burden off. Now is always the time to pray over things that He speaks to you about and urged upon your spirit. Therefore, you should pray while you have the burden, while it is fresh on your heart. This is not the time to pray over a list of things. Use this time to pray just over those urgent things. This time may be very short or very long—depending on how many things God has spoken to you about and upon how God moves you to pray. Nonetheless, you should pray until the burden is lifted or until your words of prayer have run out. Perhaps at a later time in the day or at any time in the future God will burden you again with these same needs. Then, by all means, don’t hesitate to go again immediately to prayer, and pray until the burden is lifted again. You may find that God wants you to pray at several different times, even for many years over the same thing; or perhaps just one time of prayer will do. That is up to God. Let Him lead you by the burdens or the urgings of the Spirit He puts upon you. 3. Keep a Journal. I think it is always helpful to write things down. It is an aid to the thinking process and to the memory. When you put on paper what you’re feeling, thinking, and praying, it helps you to get a hold of your feelings and to think more clearly. Your thoughts also become more real to you, and it will help you to remember what God said to you and what you prayed back to Him. What you write and how much you write is entirely up to you—according to how much you like to write and how much you feel it helps you. Do whatever you want. You can write down your thoughts and prayers constantly throughout your time of solitude, or you can make it a separate time. Some may choose not to journal at all. That’s okay too. 4. Worship the Lord with songs and hymns. A great deal of your time in solitude will be spent in mourning and confession of sins, but then, when the blessings of the Lord come to you and you feel His Spirit flood over you, let that blessed time be filled with singing and praising Him. The Psalms were meant to be sung; so sing the psalms, or you can put any other scriptures to song. Maybe you have a favorite hymn you like to sing. You can even make up your own song. Let the Holy Spirit lead you. Sing whatever He puts on your heart. 5. Pray extensively over many things. This fifth activity is the time when you will pray over all the things you can think of, and over all the lists you have. Overall, in your time of solitude, if you decide that you want to try to do all of these five activities together and in order, it may take a good bit of time. This is not something you can do everyday, especially if you have a regular job. I would suggest planning a whole day or at least a half-day for your time of solitude. Also, you don’t really need to fit this last prayer time in at the end of your other times. If you want, you can just make it a separate time of prayer. I often have enjoyed praying over many things while walking, and I sometimes take a list with me. At the end of the time I feel so refreshed, not only because of the fresh air and because of the invigorating walk, but because I have let all my requests be made known to God (Phil. 4:6); and so He gives me His peace (Phil. 4:7). Sometimes during my walk I stop along the way and sit and pray. I have special places where I like to sit—where God has often spoken to me and has given me His peace. There He has strengthened my heart and encouraged me to bring all my burdens and desires to Him, and also to pray over many other things. I want to encourage you to make this extensive prayer time a fun time. Don’t grind it out as a chore. Find a pleasant place to pray and try to sense the presence of God near you. If you have trouble praying inside, that is, if you find yourself falling asleep or your mind starts wandering, go outside—even if it’s in the winter time and very cold. The cold, fresh air will wake you up! Go for a long walk and pray. Pray for as long as you can walk. 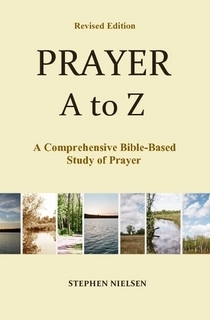 This entry was posted in Part 1-3, How to Have a Quiet Time, Prayer A to Z Excerpts, Quietness in Prayer and tagged journaling, meditation on the word, prayer, prayer walking, worship. Bookmark the permalink. I just love this post Stephen! Thanks Kimberly. You made my day! Sometimes I don’t know how to pray I keep repeating the same thing over and over. I have even fallen asleep praying. I feel so bad and wonder what god thinks, she can’t even stay awake long enough to pray. I feel ashamed. Thats a common problem. Just keep working at it. Don’t give up. Pray when you are most alert. If you can’t find the words, read a Psalm and pray through that. Or you could make a list before you pray and just pray though the list. Also, pray yoiur problem of not being to pray. He will help you. Thank for your comment. I’ll pray for you Pam.